Fins add directional control and stability to the surfboard. The surface of the fin has its own foil, which can be symmetrical (curved on both sides) or asymmetrical (curved on one side and flat on the other). Fins have flex, both horizontal and vertical, depending upon the material used to make them. 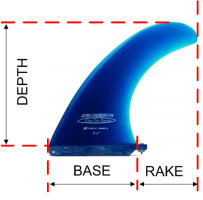 Fins have “base” (length of fin where it connects to the board), “depth” (distance the fin protrudes from the bottom of the board), tip width and rake (horizontal distance the tip overhangs the trailing edge of the fin). Fin configurations come in two basic styles; Single-fin and Multiple-Fin. Multi-fin configurations include 2+1, Twin, Tri, Quad and 5-fin. All of the fin factors I just mentioned can be used in a variety of combinations to achieve a desired effect. The combinations are almost endless. 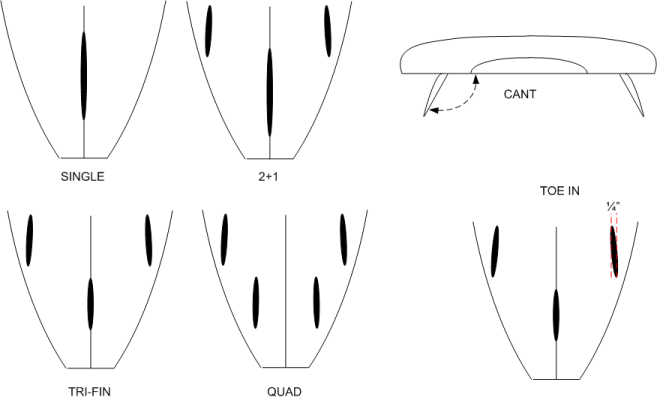 Finding the right fin and/or fin combination is critical to the overall performance of a board, as is the location of the fin on the board and/or the location of the fins relative to other fins in the configuration. Trying different fin templates, sizes or combination of fins is one way any surfer can fine tune the performace of their board. There are some who say the right fin can transform a “dog” into a “magic” board. Rules-Of-Thumb: Narrow tip is easier to turn, while wider tip offer more stability. Wider base offers more drive, while narrower base turns easier. Stiffer flex gives more drive and speed, while more flex turns easier.